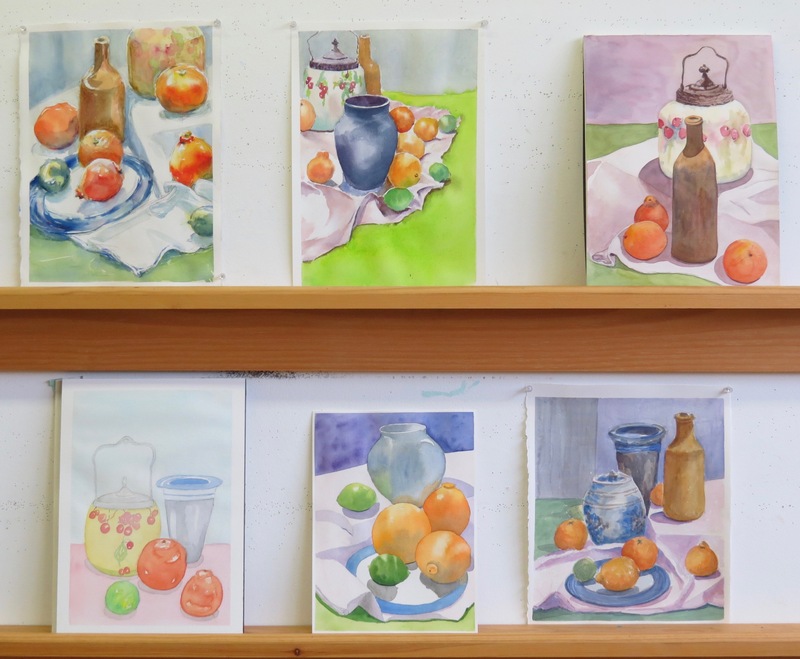 Wednesday Watercolour at DVSA – Week Seven! 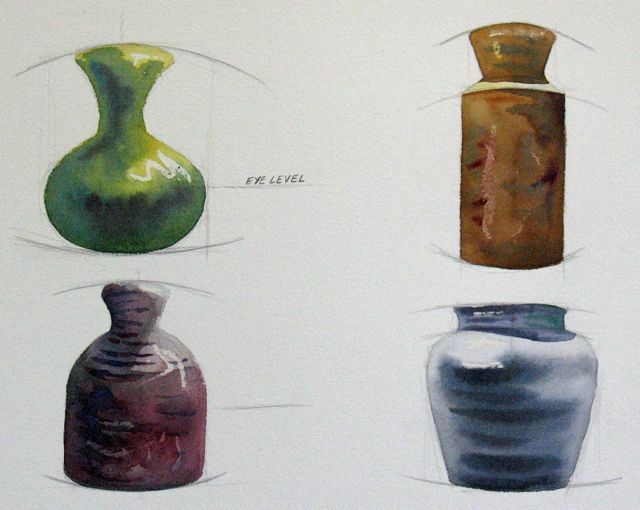 I like these geometric objects as a watercolour subject as they can be broken down into their component shapes. Each shape can be painted with a soft-edge transition; wet touching wet. Soft-edge techniques have become a major theme of this Wednesday evening class at the Dundas Valley School of Art. Why not? These techniques are fundamental to the medium and were, once again, the focus of my demonstration. The students have been working hard. Some are doing homework and it has paid off. They are becoming increasingly confident (although you wouldn’t know it from listening to them) and I like their progress very much. We have one more class to go this term. See you next week! 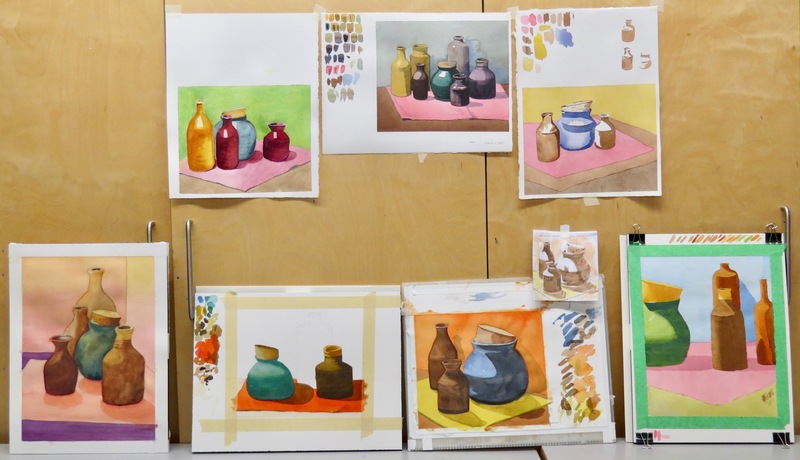 Winter Tuesday Watercolour Class – February 23! The teddy bears were back on Tuesday and eager to pose for the afternoon and evening classes. My demonstration for the Sustained Saturday class last weekend seemed to hit the mark so I presented the same basic thoughts on Tuesday. I used ‘soft-edge’ techniques within the component shapes of the bears (and monkey). 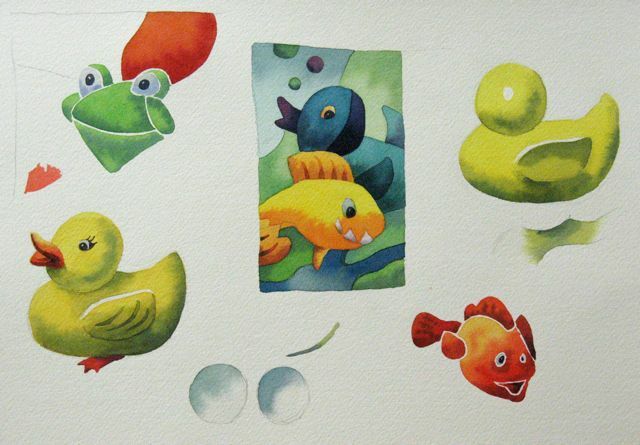 In each shape, I started with a light wash before touching in a darker value while still wet. The Tuesday students enjoyed painting our furry friends. Many would have liked a bit more time to work on their watercolours. I’m impressed with some of the colourful and effective backgrounds conceived by some of them. 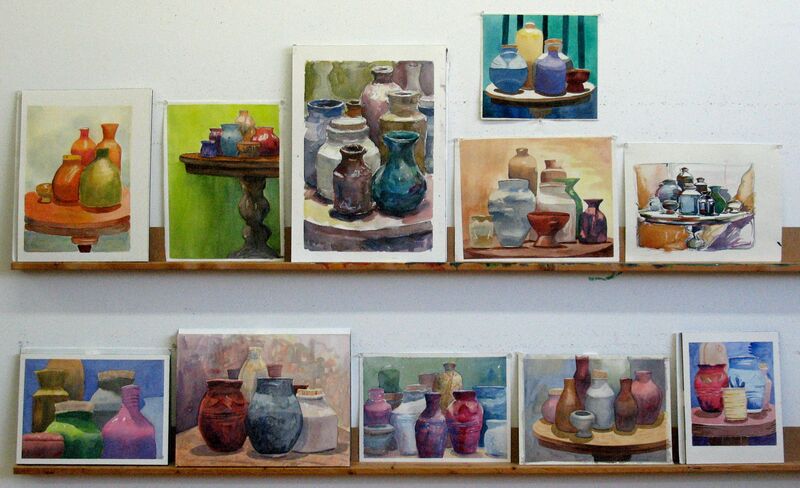 My winter classes are over at the Arts on Adrian studio in Toronto. I’ll be back in April. Next week, I’m off to San Migeul de Allende, Mexico with a lucky group of watercolour painters. Stay tuned for our creative adventures in the sunshine. Can you draw a hot bubble bath? That would be the perfect spot for these toy critters. The Tuesday students couldn’t just turn on a tap, though. They had to draw and paint these guys. Also, they had to tap into their personal wells of creativity. Everyone had three toys at their own work table so they could arrange them in any way they chose. 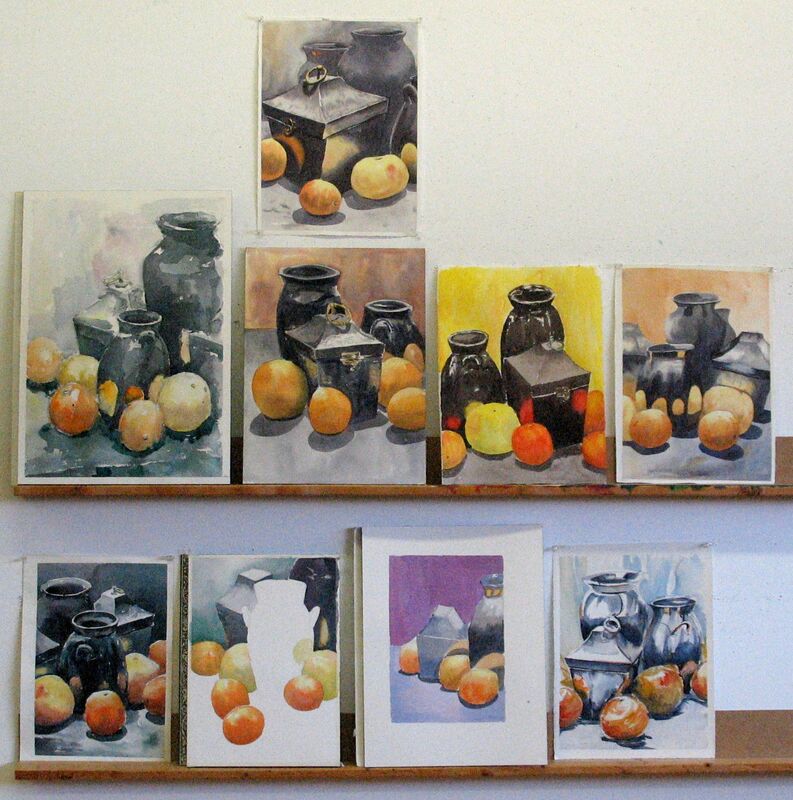 Last spring, we had a ‘special project’ without a traditional still life in the middle of the room. Everyone had a seashell. We did it again in the autumn; milkweed pods were our inspiration. As far as I was concerned, any treatment of the subject was allowed. Enjoy the shapes and colours. Tell a story. Create a non-traditional design. I explored a few ideas on my demonstration sheet. Some are more interpretative and others more conventional. Brush-handling is essential to all. I’ve used the brush in different ways to create soft edges. Imagination can’t be taught. It can be encouraged, however. 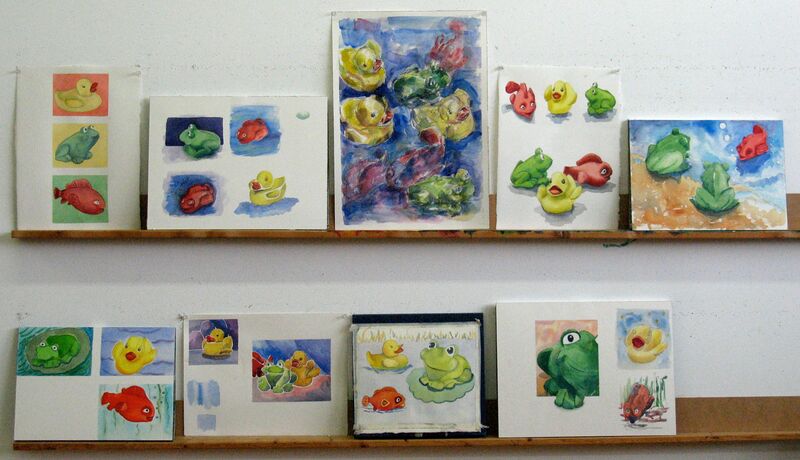 Sometimes, it helps to consider your painting as a creative exercise with certain parameters. For example, the small painting on my demonstration sheet was drawn with pencil. The shapes were painted one at a time and a darker colour or value was touched into each shape while it was still wet. No shapes were allowed to run into each other. It was a good way to practice a basic soft edge technique. I’m showing you this watercolour by Elizabeth Jay because she had to leave a few minutes early and I wasn’t able to include it in the critique photo. I like it, too. Elizabeth used a bit of wax. 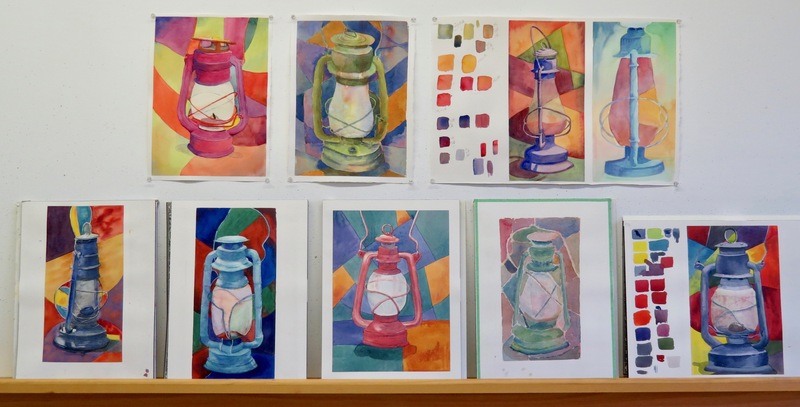 She also managed to create layers of depth with her use of cool and warm colours. I’m not sure if the students were elated or exhausted at the end of each class. Some of the results are more playful than others but it was a positive experience overall. 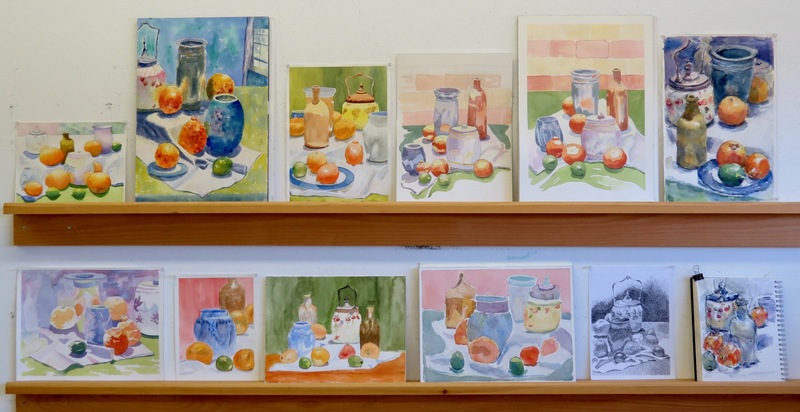 Tuesday Watercolour Class – Week Seven! Black objects! Now, there’s a challenge for you and, if that isn’t enough, look at all of those reflections. My demonstration dealt with two main things. First of all, how do you make black when there is no black in your palette? I showed two combinations that work very well. The first is a balance of Cobalt Blue and Burnt Sienna. Ultramarine Blue can be substituted for Cobalt Blue. The second is a mix of Phthalo Green and Rose Madder Quinacridone (almost any cool red will work). I suggested that the students try both on a study sheet and see which they preferred. I think it’s best and more consistent to stick with one mixture of black in a painting. In addition to that, it’s important to keep the darkest values fluid and transparent. A thick buildup of paint, as in an acrylic or gouache, will be opaque and kill luminosity. We also touched on sharp or crisp edge reflections. 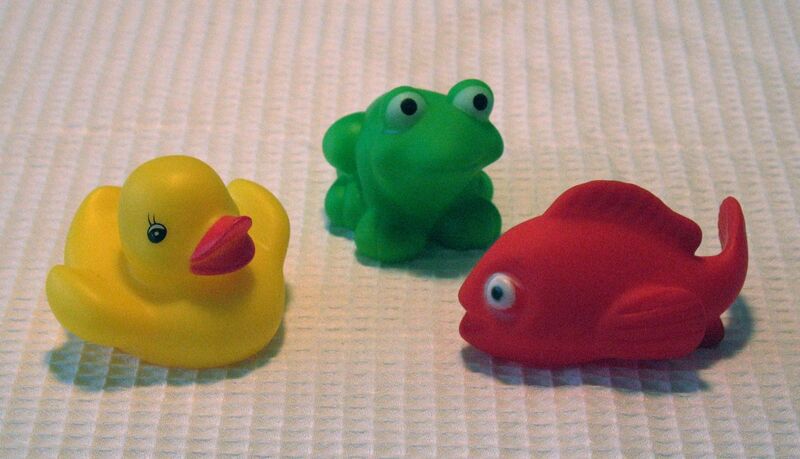 These can be painted as shapes and allowed to dry before adding the colour around them. Note that the lightest area of the reflection is darker than the light on the actual object. Go ahead. Read that again. Now, you’ll see that the light on the actual orange is much lighter, and thinner, than the light in the reflection. We didn’t discuss soft edge reflections. They’re harder to control as wet must touch wet to achieve a soft edge. 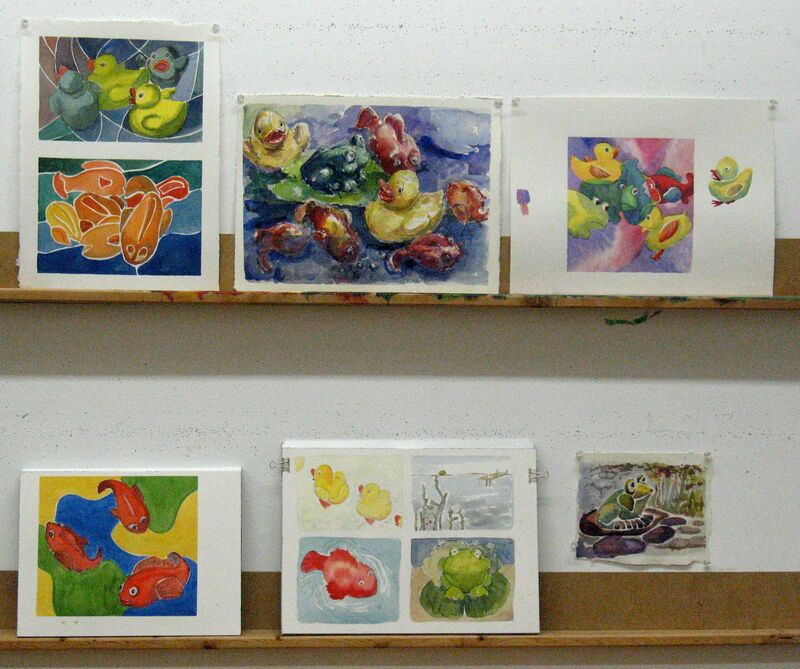 Undaunted, many of the students went ahead and created some successful soft edge reflections in their paintings. Everyone seemed to be very engaged in the challenge of mixing and applying blacks. 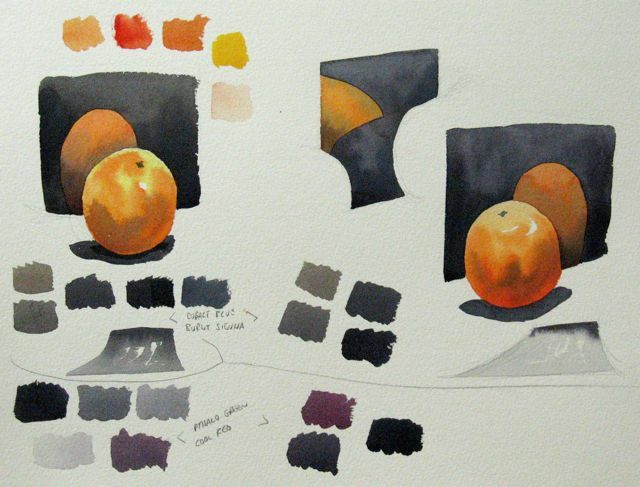 Obtaining different values and maintaining a consistent hue was a good learning experience. 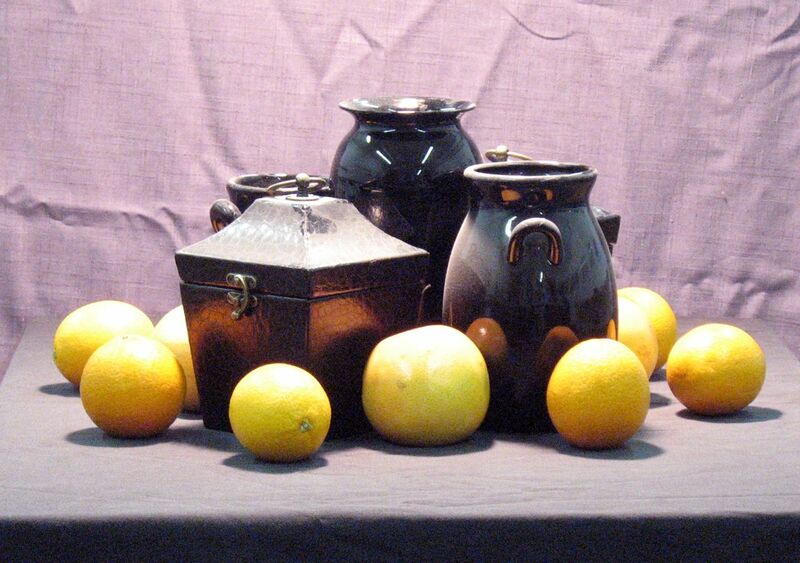 Also, the presence of so much black in the still life gave the watercolours a very dramatic quality. ***NOTE You may have noticed that I published an incomplete post earlier. This is an update. Sorry about that! WordPress is a great blogging platform but the Publish button is too close to the Preview button, in my humble opinion. Also, a DO YOU REALLY WANT TO PUBLISH NOW? step in the process would be much appreciated and save the bother of an occasional incomplete post arriving in your mailbox. So, here we go with my updated post. Smiles and frowns! You might think I’m talking about the emotional ups and downs of watercolour painting. I’m not. I’m talking about how ellipses look when we’re looking at them from different points of view. 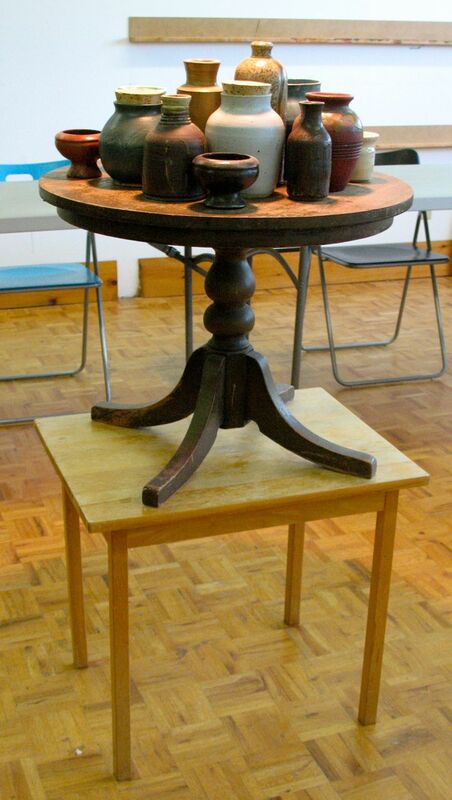 I set up the Tuesday still life on an elegant round table on top of another small table. Most of the students, not all, sit to paint. 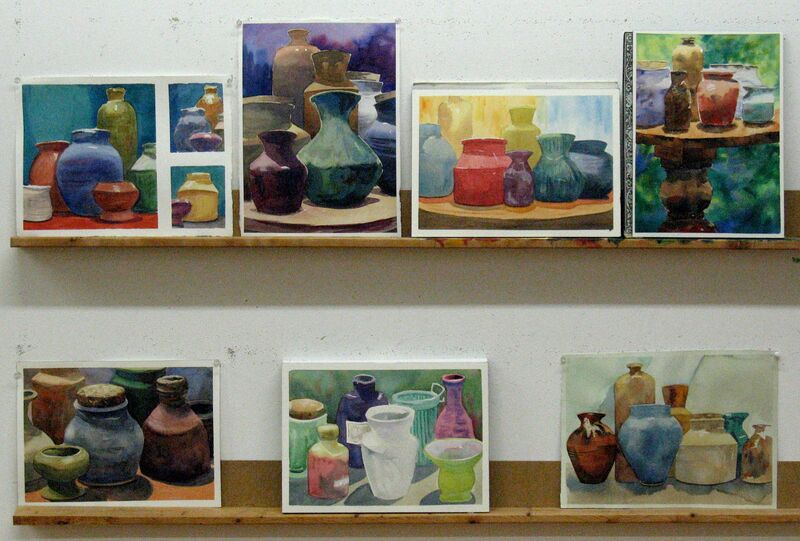 The entire still life is usually below their eye level. Raising the still life raised a little blood pressure, initially, until the students adjusted to a still life at their eye level. Ellipses are hard enough but what’s a smile and what’s a frown? 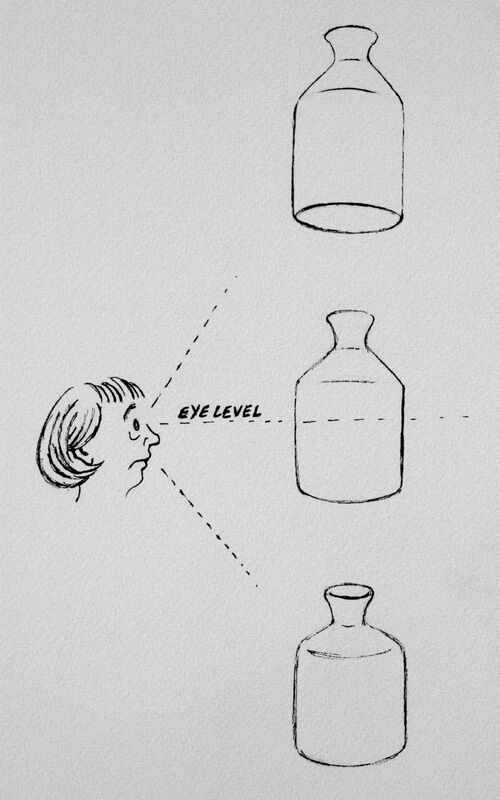 Take a look at the eye level drawing of the vase in the diagram. All of the ellipses above eye level are highest in the middle and lower on the left and right ends. Frowns. The ellipse at the bottom of the vase, below eye level, is lowest in the middle. A smile. 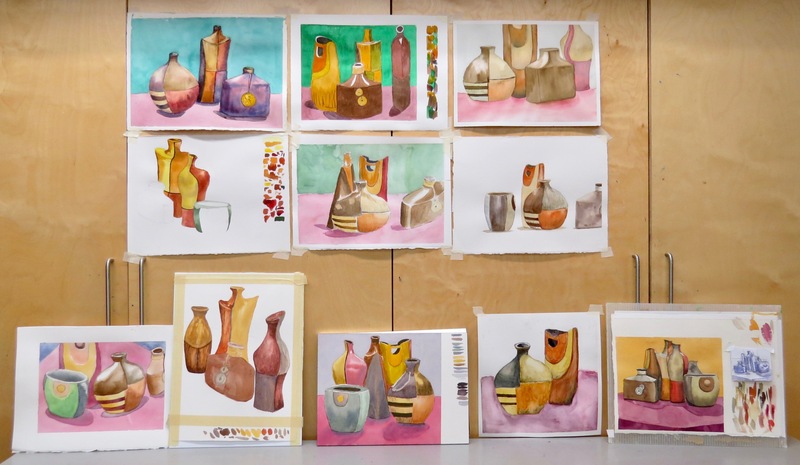 Note that the perplexed student can see the bottom of the vase in the upper drawing and can look into the elliptical mouth of the lower vase. There you go. Rudimentary ellipse theory. I’ve exaggerated the smiles and frowns a touch in my demos. 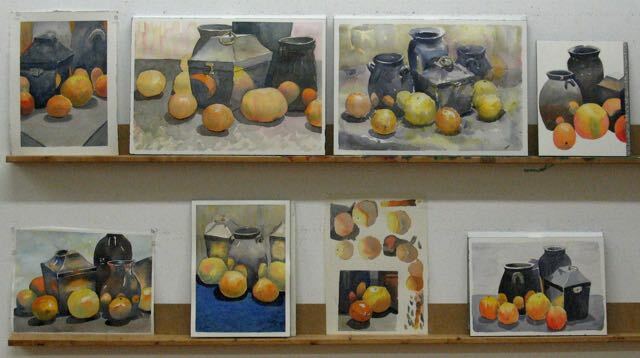 In addition to our discussion of ellipses, I used some wax as resist in these studies and focused on simplification. 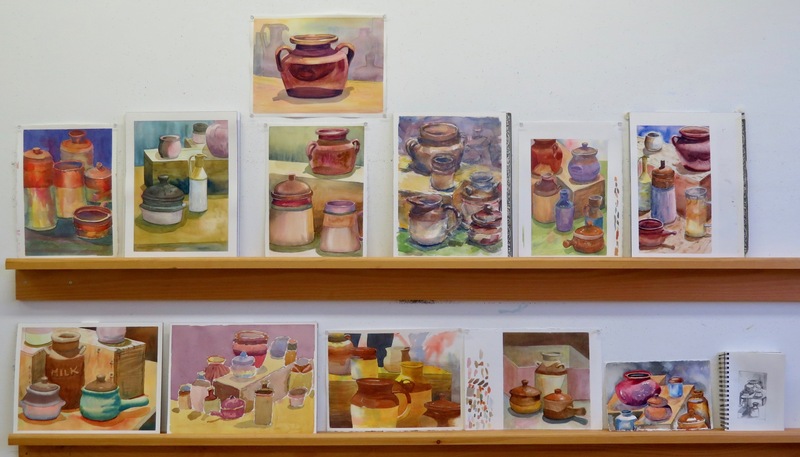 One more week to go and spring term at my studio will come to an end. 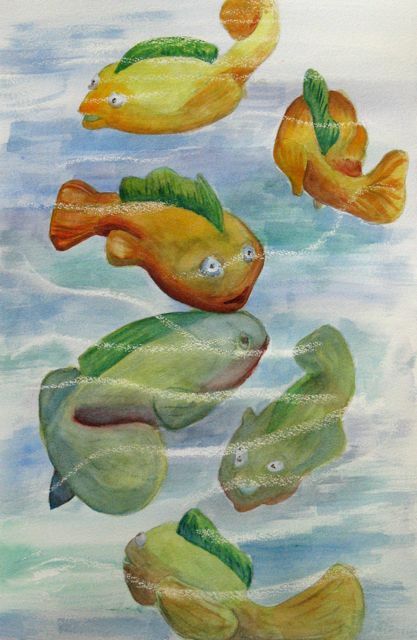 In the meantime, enjoy the watercolours from the Tuesday classes and keep smiling!